I always keep an eye out for books about interior decorating but my prize finds are those published pre 1950. I love reading the advice given to home owners. The social history contained in the pages of such books is so interesting and the decorating tips that are given to the reader often ring as true today as they did back then. 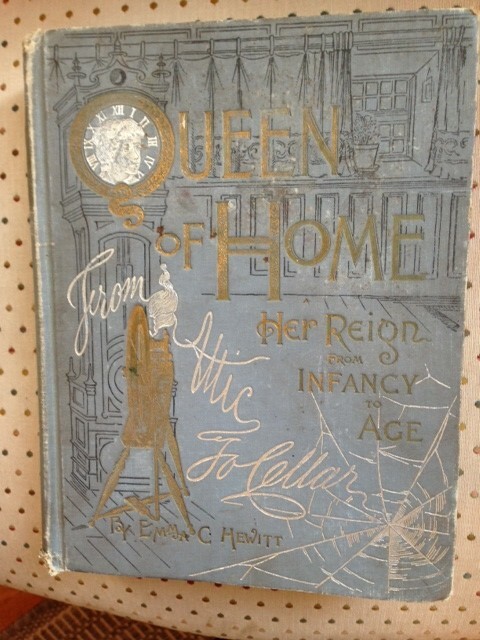 “Queen of Home” was written by Emma C. Hewitt in 1895 and from the minute you open the book you realize it was written for a young woman just starting out in her married life. It’s hilarious to read some of the advice such as “a young couple should get their own place immediately upon getting married – and not to live with parents”! The writer encourages the young woman to ask for ideas on every aspect of home-making and child-rearing from family members but cautions her to make up her own mind. The book is full of such gems.